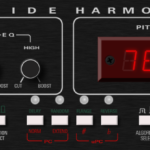 The first point of make clear about the Dynacord DRS 78 is that it is a digital echo and reverb system in one. Besides giving a very wide range of reverb and echo effects it produces above all true and absolutely natural reverb effects as they have been obtainable so far only in studios or in cathedrals. The electronic calculator of the unit is interleaving approximately 1,000 individual echos per second by chance in such a way that the human ear can no longer discern their sequence. Due to the fact that all signals are processed in a true digital manner a large bandwidth is obtained within the memory store. It is also possible to read a certain word or sound into the digital memory and to repeat this word any length of time without any loss in the treble range. In order to avoid any influence on the naturalness of the sound a filter is incorporated at the output which serves for imitating the different absorption factors for the various frequency ranges, because high frequencies are being absorbed much faster in the course of time than low frequencies. Besides producing true natural reverb effects of course the unit also produces any other echo and reverb delay effects. By means of a ring counter three different echo delays between 6 – 320 msec can be selected, preset, stored in the memory, and can be also recalled. 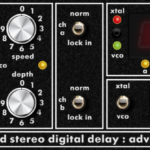 All functions of the unit such as switching echo/reverb, volume reverb, volume echo, and selection of the three preset echo delays may be controlled remotely.